The Hermit Kingdom is threatening the U.S. and Japan after the United Nations hit the country with new sanctions. North Korea is threatening the U.S. and Japan — again. The Hermit Kingdom said it wants to sink the Japanese archipelago with a nuclear bomb and turn the U.S. mainland into "ashes and darkness." The North has threated the U.S. and Japan before. This time, it's in response to the United Nations slapping fresh sanctions on the country over its recent nuclear test. In short, the sanctions ban North Korea's textile exports and limit imports on refined petroleum products and crude oil. The sanctions are a watered-down version of what the U.S. initially suggested. Still, North Korea called them an act of "state terrorism." North Korea also took time to jab South Korea. The North said its resentment is growing and that "pro-American traitors should be severely punished and wiped out with fire." 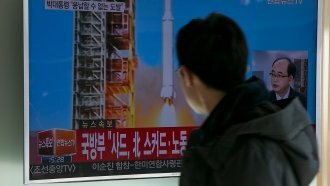 North Korea said the sanctions only harden its resolve and that it will continue building its nuclear force.